Lower Cathedral Valley, located in the northeast corner of Capitol Reef National Park, is one of the park’s most photogenic areas and is a popular destination for photographers and sightseers. A gravel road just west of Caineville takes you to the base of the cathedrals (high clearance and/or four-wheel-drive vehicle is recommended). 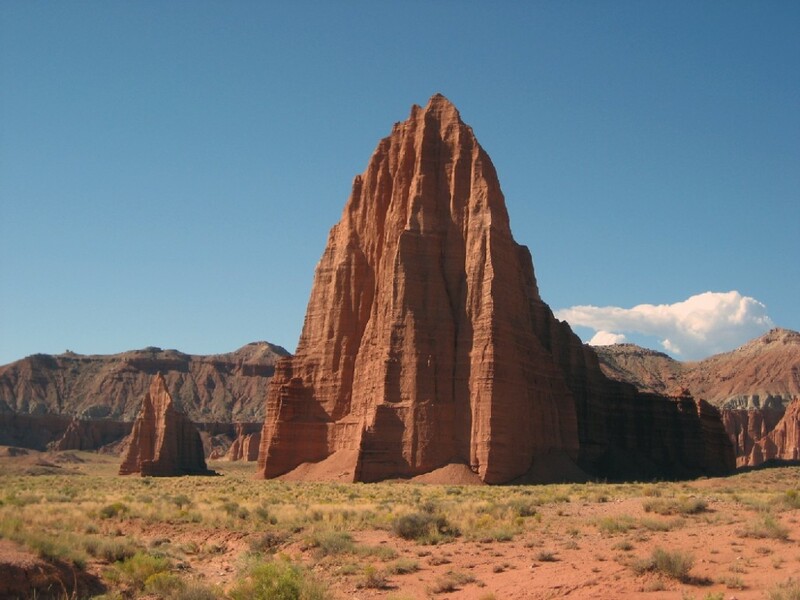 Lower Cathedral Valley contains numerous, large stands of massive rock called monoliths or cathedrals. Two of the largest cathedrals are Temple of the Sun and Temple of the Moon. The cathedrals consist of finegrained sandstone and siltstone in shades of red to reddish-orange. The color is the result of tiny amounts of hematite (an iron oxide) and other iron-bearing minerals. The sandstone and siltstone belong to the Jurassic age (approximately 160 million years old) formation called the Entrada Sandstone, the same rock formation that makes up the hoodoos or goblins of Goblin Valley State Park and the arches, fins, and spires of Arches National Park. 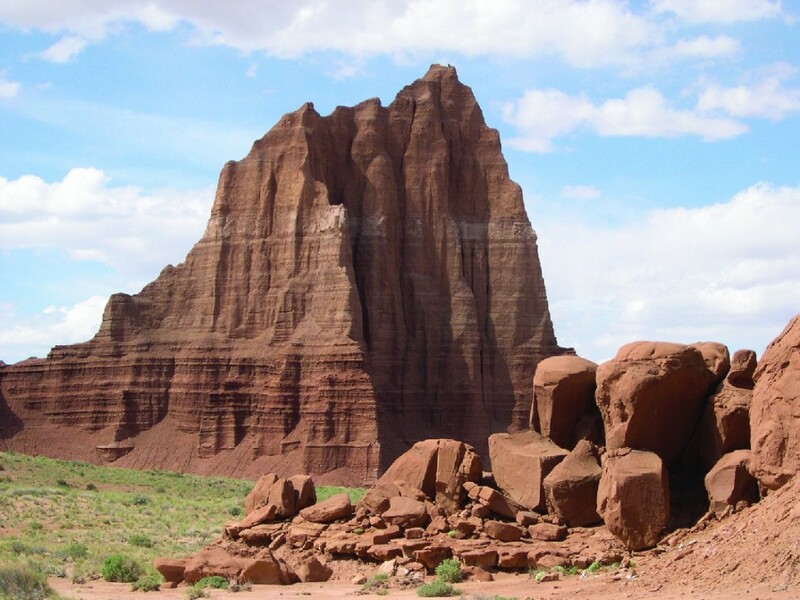 During the Middle Jurassic, extensive tidal flats covered the present area of Capitol Reef National Park, where a large amount of sandy mud was deposited. The Entrada Sandstone contains areas of fractured and unfractured rock. The fractured, jointed, rock is partly responsible for monolith development by creating zones of weakness where surface water penetrates the sandstone, which slowly weathers and erodes the rock. Over time, continued erosion leaves areas of unfractured, free-standing masses of rock called monoliths or cathedrals. 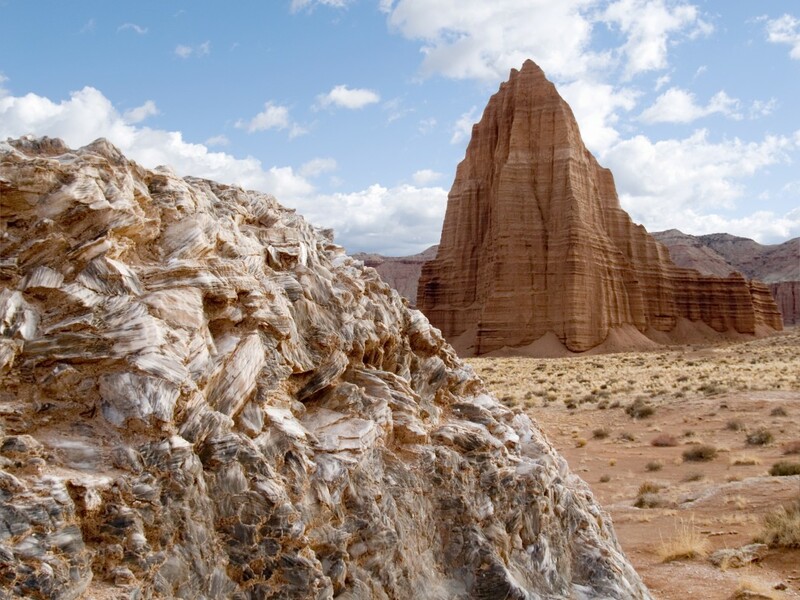 In other areas of Capitol Reef National Park, many cathedrals are still protected from large-scale erosion by overlying, weather-resistant cap rock of the Curtis Formation. However, in Lower Cathedral Valley, the Curtis Formation has been removed, resulting in the steeple-shaped appearance of the monoliths. 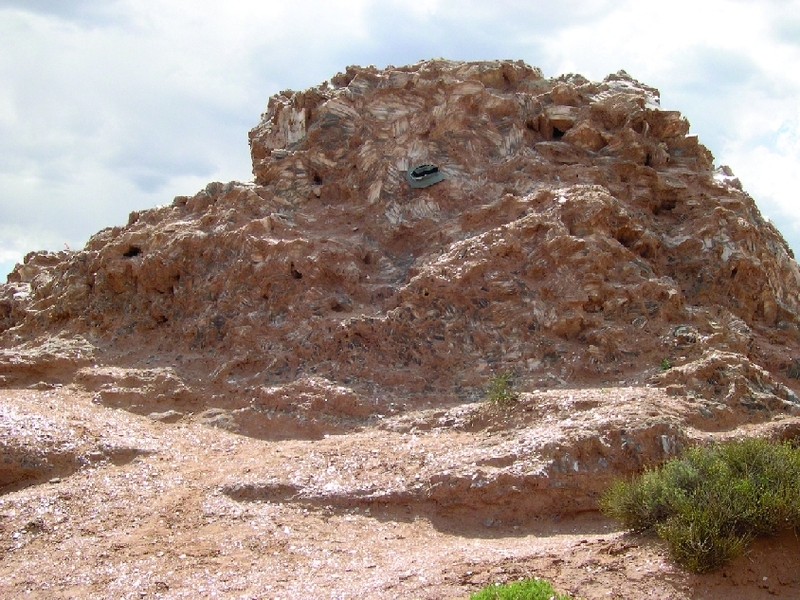 Northeast of Temple of the Sun is Glass Mountain, a geological curiosity composed of large gypsum (selenite) crystals. The gypsum was deposited from evaporating seawater approximately 165 million years ago (upper part of the Middle Jurassic Carmel Formation). 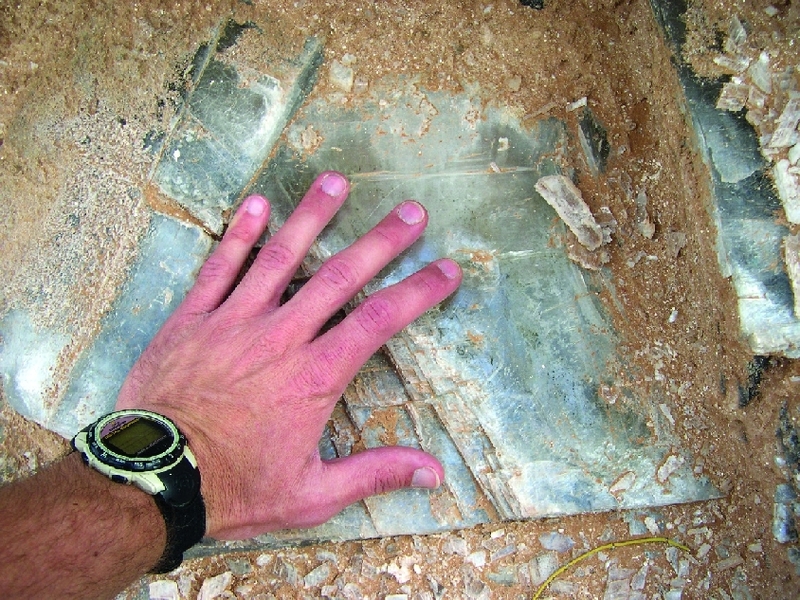 After deposition and burial under subsequent layers of sediment, the low-density gypsum moved slowly upward along faults or fractures, and in some cases formed small domes. Glass Mountain is one of these gypsum domes, rising 15 feet above the floor of Lower Cathedral Valley. Gypsum is a slightly soluble mineral; precipitation over an extended period of time will most likely dissolve Glass Mountain and create a sinkhole. From the town of Torrey in Wayne County, travel east on Utah Highway 24 approximately 25 miles to the turnoff for Lower Cathedral Valley, located just west of Caineville. If your approach is from the east from Hanksville, travel west on Utah Highway 24 for about 18 miles to the turnoff. The turnoff is not well marked, so proceed with caution. Travel north approximately 18 miles to Lower Cathedral Valley (road junction). Turn left (west) and proceed about 0.5 miles until the road splits in two directions. If you turn right (northeast), your destination is Glass Mountain. If you turn left (west), Temple of the Sun is less than 0.5 miles away. Deep Utah coal deposits – repositories for greenhouse gas emissions? Glad You Asked: What are fulgurites and where can they be found?